Josh Burr rehearses with the WCU Pride of the Mountains Marching Band. 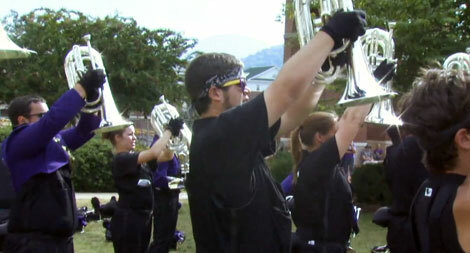 Western Carolina University freshman Josh Burr describes his experience with the WCU Pride of the Mountains Marching Band and the excitement of preparing to march in the Rose Parade on Jan. 1, 2011. Burr also talks about what Jeff Throop, president of the Rose Parade, predicted about the band’s performance in Pasadena. Burr, who plays baritone in the band is majoring in communications with concentrations in broadcasting and public relations, is from China Grove and graduated from Jesse C. Carson High School. This video was created as part of the First Year Experience http://fye.wcu.edu video initiative by WCU student Joseph Hader with music from Anders Link.